02 Do You Really Want To Hurt Me? 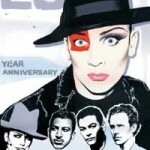 CULTURE CLUB first came to prominence, during, what we now affectionately call the “Video Age”. The rise of the video was a , colourful cultural postcard and BOY GEORGE knew how to use this medium to the maximum effect. Since 1982 when JON MOSS visited STEVE LEVINE at his studio to deliver 3 numbers on a “demo” cassette the Band has achieved success on a global scale with initially the Hits coming thick and fast not only in the UK but also America, Europe, Australia and Japan which they also conquered. As Boy George’s image became increasingly more outrageous-so the Hits just got bigger all over the world. Boy George said of this historic 20th Anniversary concert at London’s prestige Royal Albert Hall during the summer of 2002 “I shouted at the audience “I’m f****** singing a ballad, shut up” and Roy said afterwards “In twenty years, you ain’t changed” and howled with laughter. I often describe Culture Club as a living soap opera and I’ve asked friends to tell me never to tour with them again at my lowest moments. 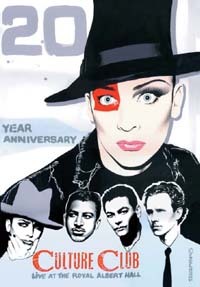 ...a recounting of Boy George and co’s deliciously well-staged comeback concert, complete with all the hits, costumes and quirky one-liners you could hope for.